I have spent the past month pretending to dribble a soccer ball while walking to and from work to the subway. I’ve watched so many videos of Lionel Messi highlights, that I think I might know how to speak Spanish. I read article after article and listened to hours upon hours of sports analysis in the dumb hope that somehow that would give me some oracle-like foresight to figure or influence the outcome of the World Cup. The storybook ending I wanted didn’t happen, my team lost, my hero didn’t get his prize. I am horribly depressed over it. This would have seemed like an impossible reaction a month ago. The look on Messi’s face, when his free kick went wide and he recognized that it was over, it made my heart sink. That’s the wonderful and ridiculous thing about sport, isn’t it? The British have this expression when they are bitterly disappointed, they talk about being “gutted” which is really the perfect illustration of the feeling of loss you get when your team, your team loses. It’s as if your fiercest enemy in the world has taken a jagged knife, sliced you from navel to nose, all your insides have fallen out in a steaming, beating, bloody mess all across your feet before the rest of your hollowed out body crumples into a limp heap atop it. It’s probably going to take at least a week for me to pull myself back up, piece it all back together and recover. I’ve played sports for as long as I can remember. My parents kept us involved to keep us out of trouble since we lived in a questionable neighborhood. I know how thrilling competition like that can be, that a team can become your family, how hitting that clutch shot/goal/homerun can make you feel like anything is possible. I also know the flip side of that, how crushing it can be when you choke or there is a missed opportunity to score or your team just couldn’t get it together for some reason, you lose and you feel like this is a pronouncement on your place in the universe. I never thought I could feel those things just by being a spectator. Sport is so overwrought with emotion and drama. The business of sport knows this and takes a lot of our money exploiting it. I definitely get caught up in those Adidas and Gatorade commercials that turn athletes into predatory animals, games into battles, trophies into moments of destiny. At the very heart of it I think following a team/player allows us to recapture a little bit of the youthful hope that we might have lost along the way. Watching athletes do things that not only make the impossible seem possible but make it look easy, makes me want to break out in ebullient shouts or go out and recreate historic feats of athleticism. You forget your cares just for a while and bask in the glow of a thing doing what it was meant to be doing in a perfect moment in time. Consider this once social sports fan a converted soccer fan, you’ll see me in my Barca jersey (obviously Messi’s #10) in front of the tv this La Liga season. P.S. One of the additional, wonderful discoveries this past month are the Men In Blazers who are two British guys who care passionately about soccer, especially about soccer becoming popular in the U.S. specifically, and offer hilarious commentary on games. They were an absolute delight. P.S.S. Don’t worry this isn’t going to turn into a soccer blog. I am a soccer fan now. I played for a little while on an indoor soccer team so understand a little bit about the joy of running around and the exhilaration of the ball hitting the back of the net, but I’ve always played sports that primarily depended on my hands (e.g. volleyball, softball, basketball) and virtually zero exposure to soccer on the professional level so the love of the game didn’t resonate with me until this World Cup. By pure dumb luck I got Argentina in a World Cup sweepstakes draw with my old co-workers. I’ve tried to do fantasy football and soccer and just got bored and stopped paying attention. I don’t really like watching sports. I don’t feel that affinity with a team because it’s my hometown, or get excited about crunching the numbers. The only times I’ve gotten excited about watching sport is when there is a compelling narrative centered around a person or group of persons, something that adds drama to the proceedings. I’m that person. The person that is in it for the personalities and the relationships, the person that will cheer for the underdog just because it will make a more interesting ending if they win. Anyway, I figured at least with the sweepstakes all I had to really worry about was following the team and not individual players and their numbers, it didn’t take much effort on my part to figure out if my team made it through to the next round. 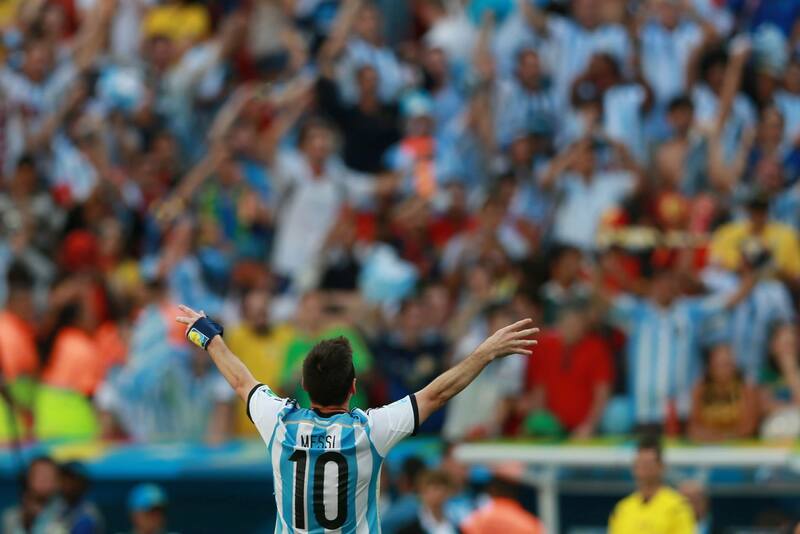 Enter Lionel Messi, namely the profile piece in the New York Times Magazine, The Burden of Being Messi. It had all of the ingredients to get me to not only to follow a team but to care about it. Messi has a compelling and sweet backstory – kid with unbridled talent who had a hormone deficiency that left him smaller than the rest of the boys, but didn’t stop him from owning the competition whenever he stepped on the pitch. He was so small (and is still pretty small) that they nicknames his “La Pulga” (the flea). The hormone deficiency required treatments, treatments that his family couldn’t afford and none of the Argentinian teams wanted to pay for. He gets scouted by the Barcelona team, who after seeing him at one try out decide to take him not only footing the bill but bringing his whole family over to Barcelona to train at their academy. His contract was drafted on a napkin and signed when he was only 13. 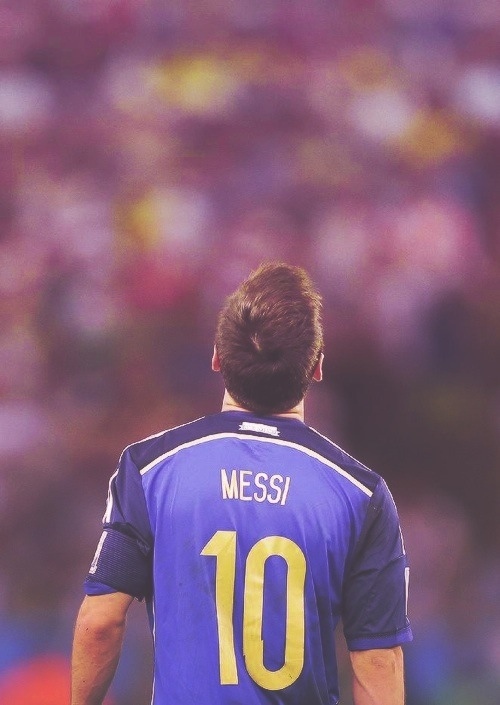 He is 27 now and has played professionally since he was 17, he’s considered the best futbol player to have ever lived. He’s broken record after record, but he hasn’t gotten the World Cup. Not only is this cup big for him in that it’s one of the only real prizes in soccer he hasn’t gotten, but he’s doing it playing for a country that doesn’t seem to like him very much. From the many many articles I’ve read, Argentina seems to resent Messi for leaving so young and not coming up through their system. They see him as a traitor, winning championships for Barcelona while playing poorly and getting knocked out early in his past two World Cup performances. Personality-wise he’s also the complete opposite of Argentina’s soccer hero Maradona whose name always comes up when talking about Messi and his legacy. He shies away from the spotlight seems kind of embarrassed by it actually and is a family man, openly doting on his son even tattooing his name on his left leg and putting his name on all his shoes. The Argentina National Team has made it to the semis, they’ll face the Netherlands on Wednesday, the way things have been going they might as well call it Messi vs the Netherlands. He’s scored 4 out of their 7 goals himself and had a direct hand in 6 out of the 7. He’s carrying that team on his shoulders. I have basically been eating all of this up. I didn’t even mention how amazing it is to watch him by this time I’ve watched a lot of youtube videos with his highlights and it’s just incredible to see him weave in and out of multiple defenders who are throwing bodies in his path and pulling on his shirt, he makes goals at impossible angles, he’s also a play maker and one of the most effective passers in the game. The FiveThirtyEight blog even wrote this awesome article crunching the numbers on his efficiency as a player – Lionel Messi is Impossible . He’s pretty much everything I want in a player to root for. Getting lost in the black hole of Messi articles and videos, I’ve actually had a lot of fun reading the analysis and seeing the numbers get broken down. It’s made me really care about what is happening in the World Cup overall, I haven’t missed a game. The thing about the World Cup, Messi and the story aside, is the really interesting microcosm these games are of the world. I’ve learned a lot about the history of Argentina just by reading about Messi and the complicated relationship his country has with him. The really long history of the rivalries between teams and countries. There’s this extra weight about a loss in soccer that seems heavier than even the Olympics. Anyway this is just what’s on my mind right now and friends around me is probably tired of me trying to engage them in conversation about it. There are only 3 games left of the World Cup (Germany vs Brazil – Tuesday, Argentina vs Netherlands – Wednesday, Final on Sunday) but I have a feeling I won’t stop watching futbol once the cup ends. For now I leave you with one of my favorite Messi goals.